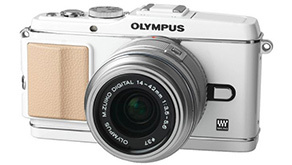 London, 30 June 2011 � When Olympus launched its PEN Micro Four Thirds system cameras in 2009, it created a whole new camera category. Two years on it has launched a visionary new flagship PEN that defies categorisation altogether. The PEN E-P3, or simply �PEN�, has the fastest* auto-focus of any camera with interchangeable lenses. With its world-beating FAST AF (Frequency Acceleration Sensor Technology), timeless metal design and state-of-the-art touch-sensitive OLED display, it�s a genuine alternative to bulkier and more expensive SLRs. Leading a three-strong generation of new PEN cameras; it owes its amazing focussing speed to a powerful new processor: The TruePic VI image engine designed especially for mirror-less cameras. In addition to the new FAST AF, TruePic VI serves as the motor for ten Art Filter special effects and the large, tap-sensitive OLED display that previews and plays back in photo quality. In combination with a faster and more sensitive 12.3 Megapixel sensor, TruePic VI ensures outstanding picture quality, especially in low light. For experienced users, the PEN has more special treats in store � two dials on the back for making quick adjustments to exposure and aperture, plus in-body image stabilisation that counteracts camera shake irrespective of the attached lens. The PEN E-P3 14-42 lens kit is available from August 2011 for �799. Pick up the new E-P3 and you realise you�re holding a potential style icon. The craftsmen at Olympus have managed a rare feat, drawing on the charm of the golden era of camera design some 50 years ago to create a camera that will still turn heads 50 years from today. If their vision was a timeless classic, that�s exactly what they achieved. With its compact design, user-friendly features and first class picture quality, Olympus� award-winning PEN system camera range is already a firm favourite with both ambitious amateur photographers and professionals looking for a practical second camera. Led by the E-P3, the new PEN generation significantly enhances that reputation. One of the PEN�s most striking � and useful � characteristics is the sheer speed and versatility of the record-breaking autofocus. Driven by the new and powerful Olympus TruePic VI processor, the FAST AF focuses quicker* than any other camera with interchangeable lenses, giving PEN owners the very best chance of capturing fast-moving shots. What�s more, it offers 35 separate focus points, spread over nearly the whole sensor, making it possible to focus on small subjects, no matter where they appear in the picture. In low light conditions, the built-in AF Illuminator compensates for potential loss of accuracy while new AF tracking technology ensures subjects stay sharp even when they move in and out of the frame. Another potentially shot-saving bonus is Full Time AF � the focus is always active so the image is always in focus and the camera doesn�t waste time focusing when the user applies pressure to the shutter release. Unique to the flagship PEN is the three-inch, touch-sensitive OLED display. It�s not only intuitive and practical to use, but also delivers a superb, photo-quality picture, regardless of ambient light conditions. Compared to similar LCD screens, an OLED display generates superior contrast, deeper blacks and a broader spectrum of colours. It is brighter, the angle of view is wider and it uses less power. The PEN�s display offers fingertip scrolling and enlarging of photos as well as control of the shutter release, AF points and the pop-up Live Guide � the celebrated PEN assistant that makes it easy for less experienced users to get crucial parameters such as aperture and depth of field exactly right. Even professionals will be glad to note that there�s now direct access to Live Guide in P, S, M and A modes, if need be. Unlike with some of PEN�s rivals, Live Guide is available for both movies and stills. But for most serious photographers, experimenting with settings is half the fun � and they don�t want to scroll through endless menus to make their adjustments. That�s why Olympus has incorporated two additional dials on the back of the PEN. With just their thumb, users can fine-tune aperture and exposure time in an instant � without having to switch between menu sections. The chosen settings appear bright and clear on the OLED screen, or in the optional electronic viewfinder. Fans of hands-on shooting will also love the three customisable buttons they can assign to their favourite functions. The buttons, dials and new FAST AF help users react quicker to spontaneous situations and capture fleeting scenes or fast-moving subjects before the opportunity is lost. Light Tone, Grainy Film, Pinhole, Diorama, Cross Process, Gentle Sepia and Dramatic Tone Art Filters. All ten filters can be applied to both still shots and movies. The PEN records movies with a stereo soundtrack in radiant 1080i Full HD quality at 60fps � and in a choice of formats. For playing back on TV, users can choose AVCHD, which generates a smaller file size. If they want to edit their movies first, the 720p HD Motion JPEG format is ideal. It generates larger files but is easier to handle with PC editing software. At the heart of every new PEN is the powerful TruePic VI image engine. Like the processors in computers, TruePic VI is essentially two units in one, with one half dedicated purely to image reproduction. The result is outstanding quality, colour and detail, with light sensitivity boosted to an impressive ISO 12800. TruePic VI also shortens recovery time and reduces noise noticeably during movie recording. Like every other PEN, the PEN E-P3 is a system camera. The moment users purchase it, they gain instant access to more than 500 Micro Four Thirds, Four Thirds and other lenses (via an adapter), including Olympus� legendary M.ZUIKO DIGITAL range of high-quality optics. Highlights of the range are two new fast-aperture lenses. The M.ZUIKO DIGITAL ED 12mm 1:2.0 (24mm**) wide-angle �Street Photography� lens is ideal for capturing broad subjects such as landscapes, especially in low-light conditions. By contrast, the M.ZUIKO DIGITAL 45mm 1:1.8 (90mm**) portrait lens delivers remarkable portraits with beautiful background blurring. Another first-class option is the re-sculpted M.ZUIKO DIGITAL 14-42mm (28-84mm**) 1:3.5-5.6 II R. All three lenses are specially designed for near-silent operation, so users can shoot HD movies in stereo without the background whir. Their metallic casing and compact, lightweight design makes them a perfect match for the PEN. Irrespective of the specifications of the lens users attach, thanks to built-in Image Stabilisation they can be confident of capturing blur-free shots. And thanks to Accessory Port 2, they can also select from the ever-growing family of PEN-dedicated accessories, including the Bluetooth�-compatible PENPAL that automatically reformats still photos for wireless transfer to other compatible devices and social media. The PEN E-P3 14-42 kit is available with the body in classic black, white or silver from August 2011, for �799. * As of June 2011. *** SD is a trademark of SD Card Association. Panasonic unveils a range of collectables to celebrate London 2012.